Des Chroniques d'Enguerran de monstrelet Gentil-homme Iadis demevrant a cambray en Cambresis. Contenans les cruelles guerres civilles entre les maisons d'Orleans & de Bourgogne, l'occupation de Paris & autres choses memorables advenues de son temps en ce Royaume, & pays estranges. Histoire de bel exemple & de grand fruict aux franÃƒÂ§ois, commenceant en l'an M. CCCC. oÃƒÂ¹ finist celle de lean Froissart, & finissant en l'an M. CCCC. LXVII. peu outre le commencement de celle de Messire Philippes de Commines. ReveuÃƒÂ« & corrigee sur l'exemplaire de la Libraire du Roy, & enrichie d'abregez pour l'introduction d'icelle, avec des annotations en marge, & de tables fort copieuses. ÃƒÂ€ Paris. Chez Laurent Sonnius ruÃƒÂ« Sainct Jacques, au compas d'or. M. D. L XXXXVI. The historie of George Castriot, surnamed Scanderbeg, King of Albanie. London: William Ponsonby (pr. by R. Field) Folio (28.8 cm, 11.3"). , 498,  pp.. 1596 Sole edition: English translation of the exploits of Scanderbeg or Iskender Bey, the Albanian national hero — "containing his famous actes, his noble deedes of Armes, and memorable victories against the Turkes, for the Faith of Christ." Marinus Barletius Scodrensis (ca. 1450–1512), or Barleti as he was known in Albanian, was an eyewitness to the Turkish invasion of his native city, Shkodrës. He published this account of George Kastrioti, the prince known as "the Christian Alexander," roughly 40 years after Kastrioti's death. Barleti's work was originally translated from Latin into French (and notably expanded upon) by Jacques de Lavardin, and taken thence into English by Zachary Jones; the preliminary matter here includes the => first appearance in print of Spenser's dedicatory sonnet "Upon the Historie of George Castriot." Provenance: The Pacific School of Religion (properly released). 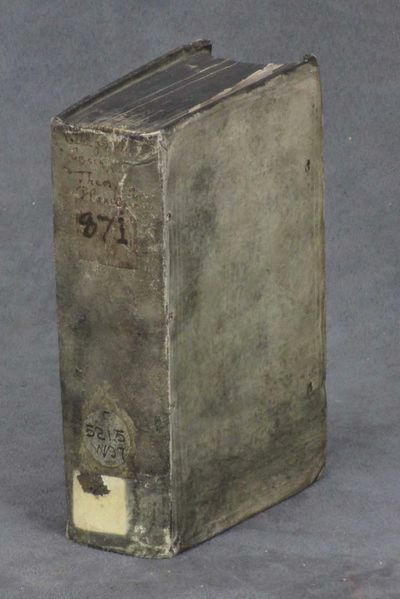 17th-century calf, spine with raised bands and gilt-stamped leather title-label; spine with extremities chipped and with hand-inked paper shelving label; binding scuffed, with spine and joints unobtrusively refurbished. As per provenance front pastedown with institutional bookplate, title-page recto and verso and one other page with rubber-stamp, back fly-leaf and free endpaper with slip and pocket. Lower outer corners of first few leaves chewed, without loss; likewise upper outer corners of 21 leaves, with loss of letters on the first of these and several words on later ones. One leaf with tear from outer margin touching text, without loss; generally, gently age-toned with scattered light spots or smudges. An imperfect copy, still a largely perfectly readable and entirely worthwhile example of an uncommon item. Stadtratsmandat - Verbesserung unnd Erlütherung der Statt Zürych Eegrichtssatzungen, antreffend die Beziehung der Ee- und andere Sachen. London: Thomas Creede, 1596. Small quarto. 19th-century red morocco, boards and spine elaborately tooled in gilt, gilt leather label, gilt inner dentelles, a.e.g. Bookplate on front pastedown and front free endpaper. Titlepage backed. Two small holes in leaf Nn3, not affecting text, small tear repaired in leaf Nn, not affecting text. Some light staining or creasing to text leaves. A very good, handsome copy. The second English edition of one of the most important early chronicles of the Spanish conquest of the New World, and one of the two chief accounts of Cortes' conquest of Mexico, the other being provided by Bernal Diaz. This is a reissue of the first English edition of 1578, and one of the handful of English works about the New World to appear in the 16th century. Lopez de Gomara was Cortes' secretary for a number of years, and made use of his unparalleled opportunity to gather information from the primary source relating to the extraordinary exploits surrounding the overthrow of the Aztec empire. "Contains the first printed accounts of the Cortes expeditions to California, the expeditions of Francisco Ulloa, Marcos de Niza, Coronado, the subsidiary expeditions resulting from the last, and the voyage of Cabrillo" - Wagner. The work was first published in Zaragosa in 1552, and quickly went through a number of editions in Spain, Italy, and the Low Countries. The English translation was prepared by Thomas Nicholas, who abridged the original. 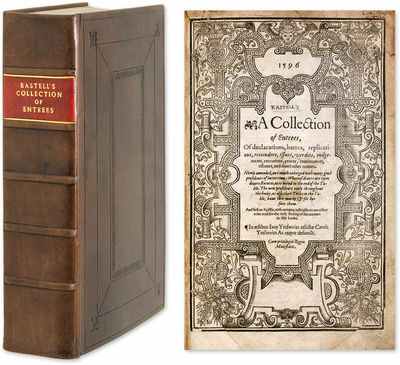 This second edition is a virtual line-for-line reprint of the 1578 edition. An important Elizabethan Americanum. EUROPEAN AMERICANA 596/52. WAGNER SPANISH SOUTHWEST 2qq. SABIN 27752. PALAU 141186. STC 16808. London: William Ponsonby (pr. by R. Field) Folio (28.8 cm, 11.3"). 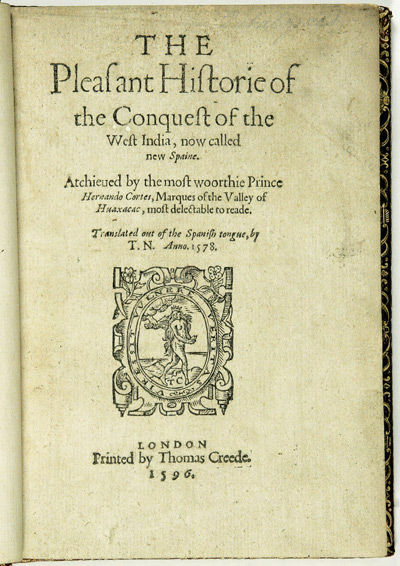 , 498,  pp.. 1596 Sole edition: English translation of the exploits of Scanderbeg or Iskender Bey, the Albanian national hero — "containing his famous actes, his noble deedes of Armes, and memorable victories against the Turkes, for the Faith of Christ." Marinus Barletius Scodrensis (ca. 1450?-1512), or Barleti as he was known in Albanian, was an eyewitness to the Turkish invasion of his native city, Shkodrës. He published this account of George Kastrioti, the prince known as "the Christian Alexander," roughly 40 years after Kastrioti's death. 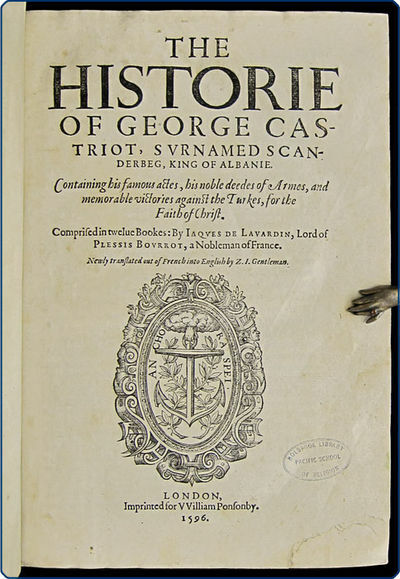 Barleti's work was originally translated from Latin into French (and notably expanded upon) by Jacques de Lavardin, and taken thence into English by Zachary Jones; the preliminary matter here includes the => first appearance in print of Spenser's dedicatory sonnet "Upon the Historie of George Castriot." Provenance: The Pacific School of Religion (properly released). 17th-century calf, spine with raised bands and gilt-stamped leather title-label; spine with extremities chipped and with hand-inked paper shelving label; binding scuffed, with spine and joints unobtrusively refurbished. As per provenance front pastedown with institutional bookplate, title-page recto and verso and one other page with rubber-stamp, back fly-leaf and free endpaper with slip and pocket. Lower outer corners of first few leaves chewed, without loss; likewise upper outer corners of 21 leaves, with loss of letters on the first of these and several words on later ones. One leaf with tear from outer margin touching text, without loss; generally, gently age-toned with scattered light spots or smudges. An imperfect copy, still a largely perfectly readable and entirely worthwhile example of an uncommon item. Verborgene heimliche Künste unnd Wunderwerck Frawen. 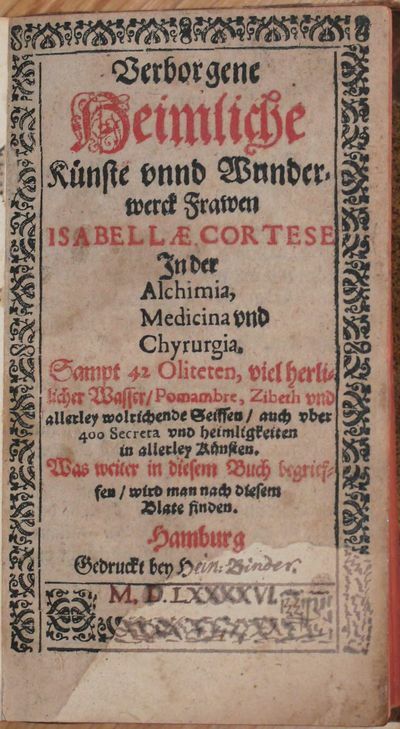 Jn der Alchimia, Medicina und Chyrurgia. Sampt 42 Oliteten, viel herrlicher Wasser, Pomambre, Zibeth und allerley wohlrichende Seiffen / auch über 400 Secreta u. Heimligkeiten in allerley Künsten. England, chart Robin Hood's Bay and Coquet Island - Waghenaer. Caerte der Noordt custe van Engelandt, beginnende van Robinhodes baij tot Cocket EijlandtTaken from second volume of "Den Nieuwen Spieghel der Zeevaardt". Published in Leiden by Lucas Janszn. Wagehenaer, 1596. Coloured by a later hand. Size: 33 x 51 cm.This chart shows the Yorkshire, Durham and Northumberland coastlines from Robin Hood's Bay to Coquet Island. North is oriented to the right of the page. Part II of the "Spieghel ..." was first published in 1585 in Leiden by the Plantijn Press and this example of the map would appear to be a first edition - the title text is only in Dutch and text on the verso is also Dutch. The signature of the engraver, Doetecum, appears at lower right. The North Sea is decorated with sailing ships, sea monsters and an elaborate compass rose, while a scale of miles is also given at lower right.The " Spieghel der Zeevaardt " is unique among printed rutters of the sixteenth century, as it was the first to contain maps. Furthermore, it outranks any other rutter of the period with its splendid presentation of charts and text. As such, it stood out as a model for the folio pilot guides of the seventeenth century. Koeman writes; "Thanks to the unparalleled skill of the engravers Baptist and Ioannes Van Deutecom, the original manuscript maps were transformed into the most beautiful maps of the period. The composition and adornment have greatly contributed to the splendour of what originally were simple sketch charts; the typography of the Plantijn printing house further added to the quality of the book". 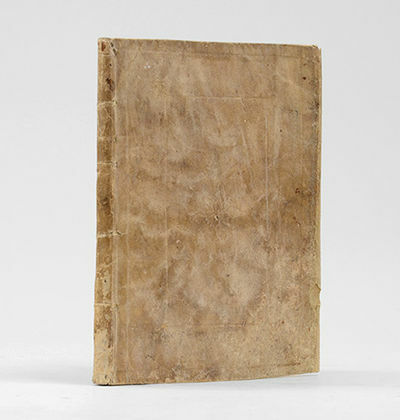 Literature: Koeman IV, Wag 10A, 26d Price: â‚¬ 1.750,- (excl. VAT). This patent of nobility ("Real Provision Executoria de Infanzonía") outlines the history of the Ximenez de Bagües family and the meaning of their assigned coat of arms. Three pages contain an "Arbol Genealogico" starting in 1596 with Don Miguel Ximenez de Bagües; two of these pages are => hand-colored with black and green ink to form leafy branches connecting members of the family tree.Printed patents of nobility are unusual as the documents were normally created as an ornate manuscript using multiple colors. Searches of the CCPB show 16 examples of printed patents of nobility and the Spanish National Library claims only one; WorldCat lists only one example held in the United States. => None of these examples describe the Ximenez de Bagües family. The final leaf is a => full-page copperplate engraving of the Don Pedro Ximenez de Bagües coat of arms in sepia ink, surmounted by a helm and banners, supported by putti, and surrounded with military impedimenta including spears, a club, a bugle, a shield, a drum, cannonballs, and a cuirass. The plate is signed "Js. Dordal" for José Dordal (1780-1808), a Zaragosan engraver known for his portraits, including one of Ramon Pignatelli. 1596. ,405,pp. Small quarto. Nineteenth century red morocco, elaborately and handsomely tooled in gilt on the boards and spine, gilt leather label, a.e.g. Bookplate on front pastedown and front free endpaper. Titlepage backed. Two small holes in leaf Nn3, not affecting text, small tear repaired in leaf Nn, not affecting text. Some light staining or creasing to text leaves. A very good handsome copy. A primary account of the Conquest of Mexico The second English edition of one of the most important early chronicles of the Spanish conquest of the New World, and one of the two chief accounts of Cortes' conquest of Mexico, the other being provided by Bernal Diaz. This is a reissue of the first English edition of 1578, and one of the handful of English works about the New World to appear in the 16th century. Lopez de Gomara was Cortes' secretary for a number of years, and made use of his unparalleled opportunity to gather information from the primary source relating to the extraordinary exploits surrounding the overthrow of the Aztec empire. "Contains the first printed accounts of the Cortes expeditions to California, the expeditions of Francisco Ulloa, Marcos de Niza, Coronado, the subsidiary expeditions resulting from the last, and the voyage of Cabrillo" - Wagner. The work was first published in Zaragosa in 1552, and quickly went through a number of editions in Spain, Italy, and the Low Countries. The English translation was prepared by Thomas Nicholas, who abridged the original. This second edition is a virtual line-for-line reprint of the 1578 edition. An important Elizabethan Americanum. European Americana 596/52; Palau 141186; Sabin 27752; Wagner Spanish Southwest 2qq; STC 16808. 1596. ,112pp. Small quarto. Full polished calf, leather labels, by Riviere. 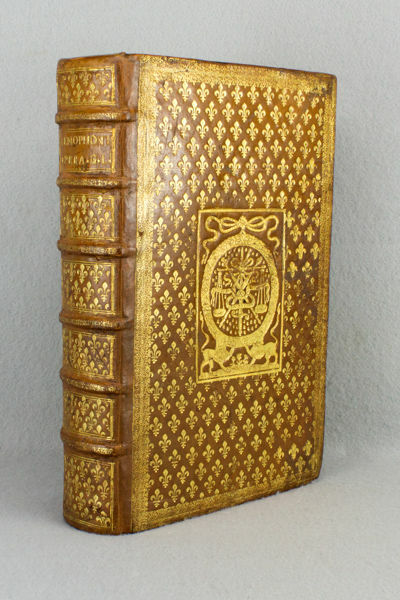 Spine richly gilt in compartments, a.e.g. Upper margin of titlepage skillfully extended, with three letters and parts of ten other letters in almost imperceptible pen facsimile. A few other minor repairs to blank margins. Else a handsome, near fine copy. With bookplates of Boies Penrose and another bookplate on the rear free endpaper. Raleigh's voyage to find El Dorado Sir Walter Raleigh, famous Elizabethean courtier and adventurer, was involved in numerous schemes for establishing English colonies in the New World and in raiding the Spanish empire in the Americas. In the 1580s he was a major figure in the English court and in naval and military ventures. But in 1592 Raleigh fell from grace for marrying one of the Queen's ladies-in-waiting without her approval, and was thrown in the Tower. When released, he had lost much of his power and influence. He sought to regain it, and make a fortune, by a voyage to northern South America to seek the legendary city of El Dorado, where he believed he would find the streets paved in gold. Raleigh's voyage, usually called his second (after his voyage to found the first Virginia colony in 1585) took place under a cloud. He was strictly enjoined from attacking the Spanish, but on arrival in the Caribbean he attacked Trinidad, siezing the Spanish governor, and raiding the coast on Venezuela. He then pressed up the Orinoco River, going more than four hundred miles upstream, where he turned back after obtaining samples of what appeared to be gold. This book details his pioneering exploration, in which he accurately describes the country in the most precise description made until the mid-19th century. The book also theorizes, at length, on the chimerical city of El Dorado and its vast wealth, and on the extraordinary gold ornaments he observed among the Indians of the region. The gold samples, however, proved to be worthless. On his return from the El Dorado expedition Raleigh resumed his active place in the English court, but was accused of treason on the accession of James I and confined in the Tower until 1616. When released, he made one last attempt at finding El Dorado, in a disasterous second voyage there which ended in total failure, and ultimately in Raleigh's execution. This is the third issue as identified by European Americana and Church (all were issued in 1596 and have essentially the same text and setting). This copy contains the misprint "Gallie" for "Gallego" on p., line 22. According to the entry in Sabin a copy was offered by a London bookseller in 1885 at Â£50. Church 254; European Americana 596/85; Sabin 67554; Hill 1414; JCB (3)i:149; STC 20636; Palau 246449-ii. 1596. 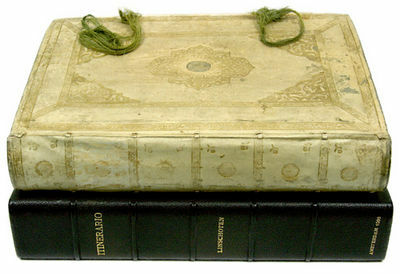 Three parts bound in one volume (parts two and three bound in reverse order in this copy). Text in double columns. ,160; 134,,135-147,; 82,pp. plus a total of six folding or double-page maps, thirty-six folding or double-page plates, and a single-page portrait of Linschoten. Folio. Contemporary vellum, elaborately tooled in gilt, spine with gilt compartments, silk ties, yapp edges. Recased, with new endpapers. Maps and folding plates with some occasional slight chipping or splits at folds, repaired on versos in some cases. Occasional tanning or foxing. Overall, a handsome copy, brilliantly colored. 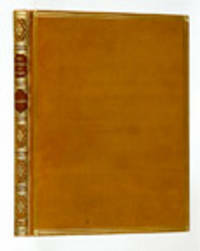 In a chemise and half morocco and cloth slipcase, spine gilt. 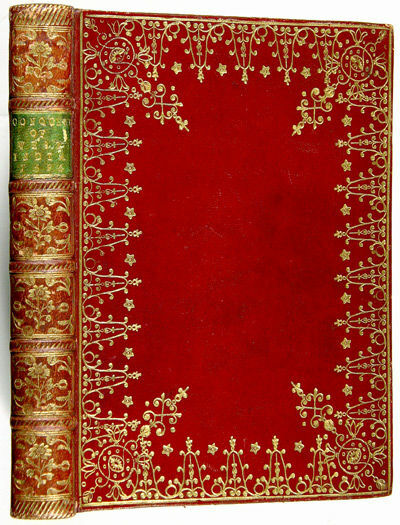 A handsome copy of this important and influential work, with beautiful hand-colouring A remarkable copy of the first edition of the most important description of the East Indies in the Age of Discovery, with beautiful early hand-coloring and in a handsome contemporary vellum binding, likely a special presentation copy. Linschoten's work was of tremendous importance, as it unlocked the secrets of Asian trade routes, once the exclusive domain of the Portuguese, for the rest of Europe Jan Huygen van Linschoten (1563-1611) a Dutchman born in Haarlem in 1563, had an "avaricious thirst for knowledge which enabled him to get detailed information of land and sea as far afield as the Spice Islands and China" (Penrose). Linschoten travelled to Goa in 1583 as a clerk of the newly-appointed Portuguese Archbishop of Goa. He made a few trips into Indian, compiling notes on his experiences, gleaned information on sea routes from Portuguese sailors, and collected information from other sources as well. Linschoten left India in 1589, hired as a pepper factor for the Fugger and Welser interests, where he learned about the organization and administration of the spice trade. Returning to Holland in 1592 (after a two-year stay in the Azores), he prepared his notes for the Amsterdam publisher, Claeszoon, in response to interest in the Netherlands and other European countries about commercial possibilities in Asia. As trade in the Far East was dependent on routes via America or Africa, his work eventually encompassed the entire globe, including Spanish and Portuguese activities in America. Linschoten's practical experience lent authenticity to his work, and it remains one of the most important of all travel books. Linschoten's Itinerario... and the two other works published in 1595 and 1596 (which should properly be found together, as here) soon was considered the single most significant source regarding the East and West Indies and numerous editions were published in Dutch, Latin, French, German, and English. Klooster describes the work as "a magnificent panorama of pictures and maps of the non-European world. Itinerario contained so much detailed and accurate information about shipping lanes, winds, and currents, that seafarers could use it virtually as a handbook. Many of his maps were in fact copies of the excellent models of the Portuguese cartographer FernÃ£o Vaz Dourado." It was the most comprehensive account of the East and West Indies available at the beginning of the 17th century. As well as including important travel accounts taken from contemporary Portuguese, Dutch, and Spanish sources, it is the first work to include precise sailing instructions for the Indies, and, according to Church (and other authorities), "it was given to each ship sailing from Holland to India." The second section, Reys-gheschrift vande navigatien..., was published in 1595, a year before the Itinerario... , and is bound last in this copy. The text gives detailed sailing directions for the East Indies, as well as for Brazil and the West Indies. The third part (bound second in this copy) gives an account of America on pages 17-82, especially the coastal regions, and includes information on the African coast as well. It is found here in its first state (see Church), and was published in 1596. The maps include van Langren's maps of the East Indies and South America (including the Caribbean and Florida), and the double-hemispherical world map of Plancius dated 1596 (Shirley 192). The marvellous plates include scenes of Asia, particularly Java, China, and India. Several of the plates depict activities in Goa, including a wonderful panoramic view of the market, while other plates depict Portuguese travellers on land and on sea. Linschoten's is an important work that served not only as a valuable record, but also as a catalyst for change in the balance of power amongst European trading nations in the east: "the navigator's vade mecum for the Eastern seas" (Penrose). When Linschoten returned from Goa to his home in the Netherlands, he did so at a time when the people of northern Europe and particularly his countrymen were especially interested in what he had to report concerning the trading activities of the Portuguese in the East. His most important and far-reaching observations concerned the gradual decline of Portuguese power in the East and her ability to protect her trade routes and monopolies. This, together with the trading possibilities he detailed, encouraged a series of Dutch, French, and English fleets to set sail for the Spice Islands, and beyond to China and Japan. Lach says that Linschoten's description of Goa is "one of the most original and reliable narratives prepared during the sixteenth century on life at the hub of Portugal's Eastern empire and still is regarded as one of the best sources for Goa's history at the peak of its glory....The original edition...contains a number of excellent maps, three of which are of great value for the study of Asia. These maps, which are much better and more detailed than earlier printed maps, were clearly derived from the latest and best Portuguese charts of the Eastern oceans and sea coats" - Lach. Parry calls Linschoten's work "a journal of human adventure and observation, an uplifting story that appeals on many levels." "Fine copies of this work with all the maps and plates are extremely rare" - Church catalogue. A work of tremendous consequence and importance, here in a handsome copy with lovely contemporary hand-coloring. European Americana 596/63 & 596/64: JCB I, pp.343-345: Shirley 192, 182; Sabin 41356; Tiele 84-87; Klooster, Dutch in the Americas, p.8 & Catalogue Item 5; David E. Parry, The Cartography Of The East Indian Islands, p.84-85; Church 252; Howgego L131; Borba De Moraes, pp.486-487; Wagner, Northwest Coast 184; Lach, Asia In The Making Of Europe, Volume 1, pp.198-204 & 482-489. FROSCHMEVSELER/ Der Frösch vnd Meuse wun=/derbare Hoffhaltunge./ Der/ Frölichen/ auch zur Weyßheit/ vnd Regimenten erzogenen Jugend/ zur ... Leer/ aus den alten Poëten vnd/ Reymdichtern .../ Jn/ Dreyen Büchern auffs newe mit fleiß beschrieben/ Zuuor in druck nie ausgangen. 1596, A Collection of Entrees, Of Declarations, Barres, Replications..
1596. "A Book of Precedents in Pleading of a Wholly New Type" Rastell, William [1508?-1565]. 1596. A Collection of Entrees, Of Declarations, Barres, Replications, Reioinders, Issues, Verdits, Iudgements, Executions, Proces, Continuances, Essoines, And Divers Other Matters. Newly Amended, And Much Enlarged With Many Good Presidents of Latter Time: Whereof Divers Are Upon Divers Statutes, As is Noted in the End of the Table. The New Presidents Onely Throughout the Booke, As Also Their Titles in the Table, Have this Marke [pointing hand] Set Before Them. And First an Epistle, With Certaine Instructions Necessary to be Read for the Redy Finding of the Matters in this Booke. [London]: In Aedibus Ian[a]e Yetsweirt Relictae Caroli Yetsweirt Ar. Nuper Defuncti, . [iv], 704 ff. Collates complete. Main text in parallel columns. Folio (11" x 7"). Recent period-style paneled calf, raised bands and lettering piece to spine. Title printed within architectural woodcut border, woodcut decorated initials. Moderate toning to text, somewhat heavier in places, stains to a few leaves, headlines in a few sections affected by trimming, minor chips to edges of a few leaves. "Rastell" in small later hand to head of title page, spark burns and tiny ink smudges to a few leaves, interior otherwise clean. A handsome copy. * Third edition. A landmark in the history of pleading first published in 1566, Rastell's Entries superseded its predecessors. The volume had notes and references and the material was not gathered exclusively from printed sources, but from "the most authentic source - the offices of the prothonotaries.... Prothonotaries were officials whose duty it was to enter pleadings in an action; and they therefore had unrivalled opportunities for accumulating a store of such precedents. Rastell seems to have been the earliest writer to make use of this store of precedents. He therefore produced a book of precedents in pleading of a wholly new type; and this example was copied by the numerous other books which appeared during the seventeenth century." Holdsworth, The History of English Law V:384-385. English Short-Title Catalogue S121759. Verborgene heimliche Künste unnd Wunderwerck Frawen. Jn der Alchimia, Medicina und Chyrurgia. Sampt 42 Oliteten, viel herrlicher Wasser, Pomambre, Zibeth und allerley wohlrichende Seiffen/ auch über 400 Secreta u. Heimligkeiten in allerley Künsten. Antwerpen, Plantins Witwe und Moret, 1596 und 1595.. 3 Teile in einem Band. Mit gestochenen und geschnittenen Druckermarken, einigen Textholzschnitten, insgesamt 12 Textkupfern (davon 5 ganzseitig) und einer gefalteten Kupfertafel. 8 Bll., 330 S., 1 w. Bl. ; 255 S.; SS. (257) - 292, 4 Bll. Rotbrauner Maroquinband des 17. Jhdts. Über 5 erhabenen Bünden, Rücken und Decken mit goldgepr. semis de fleurs-de-lys, beide Decken mit goldgepr. Wappensupralibros des Collegium Grassinaeum (Collège des Grassins an der Pariser Universität) mit Motto "Lilium inter spinas" und Dornenkronen-Einfassung auf einem Grund von dichtgedrängten heraldischen Lilien, Deckelkanten mit ornamentalen Bordüren und Filetenvergoldung; Stehkantenvergoldung und Goldschnitt.. 25,5 x 17,8 cm. Adams L 781; Jähns 561. Erste lateinische Ausgabe . Enthält: De militia romana liber primus - quartus; De militia romana liber quintus und Analecta sive observationes reliquae ad militiam et hosce libros. - Lipsius hat sich intensiv mit dem Heeres- und Kriegswesen der Römer auseinandergesetzt, seine Veröffentlichung gilt als grundlegendes Werk über das antike Kriegswesen. - Der schöne Einband mit kleinen, fachgerechten und unauffälligen Restaurierungen an Ecken und Kanten. Seltene und gesuchte Ausgabe im dekorativen Einband. Orationi del Sig. Speron Speroni Dottor et Cavalier Padovano. Novamente poste in luce. Con licentia de\' superiori & privilegi. Creta Iivis Magne Medio Iacet Insvla Ponto . - Quad fecit - Colonie formulis Janz Bussmchr.':. Ivliacum Iulic, oder Gulich, . Johann bussemacher impr.':. Lotharingiae Ducatus superioris vera delineatio. Description de la Haulte et Superieure Lorraine. - Kupferstich von Bussemacher bei Jolain, Paris, 1596, 36,5x49,5 cm *Sehr seltene und dekorative Karte mit zahlreichen Wappen im gesamten Kartenbild. Gezeigt wird das Gebiet zwischen Metz, Blamont, Neuf-Château und Bar-le-Duc, im Zentrum der Karte liegt Nancy. 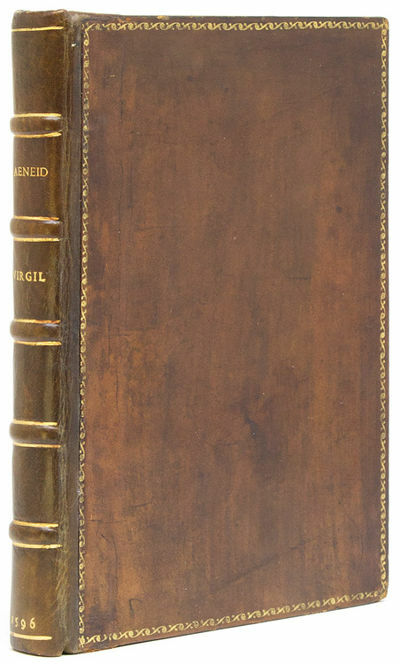 Francofurti: Apud Andreae Wecheli heredes, 1596, 1594. n. Hardcover. A Very Substantial and Dazzlingly Gilt Award for Excellence in the Study of Greek. mm (). 6 p.l., 1,013 pp., 1,014-1,213 cols.,  pp.,  leaf (colophon). Two continuously paginated volumes bound in one. Translated by Johannes Leunclavius. EXTREMELY HANDSOME 17TH CENTURY FRENCH CALF, both boards with wide gilt floral border, covers with a field of fleurs-de-lys enclosing at center a large rectangle containing the gilt arms of the Parlement of Normandy (two lions passant holding up a wreath in which a sword and sceptres support scales of justice, the wreath also containing a banderole with the motto "Compensat, Vindicat, Aequat" ["She Balances, She Lays Claim, She Makes Equal"]); wide raised bands, spine with compartments of gilt fleurs-de-lys within double gilt fillets, marbled endpapers, all edges gilt (three gouges on covers very carefully repaired, with gilt replicated, perhaps at the original time of binding, hinges apparently tightened). Printer's device on title page and colophon. Parallel columns of Latin and Greek. Second leaf with blindstamp seal of the Jesuit College of Rouen; front flyleaf with ink presentation inscription dated 1680 (see below); occasional underlining in pencil. Dibdin II, 567; VD16 X-10; Graesse VI/2, 483-84; Brunet V, 1490. Two hairline cracks on top of front cover, slight rubbing to gilt tooling at edges, minor foxing throughout (due to poor paper quality), more noticeably foxed in a couple of dozen gatherings (though never severe), intermittent very faint dampstain to lower right margin, otherwise a clean copy with ample margins in an especially well-preserved binding, the gilt still bright, and the leather showing only general minor wear. 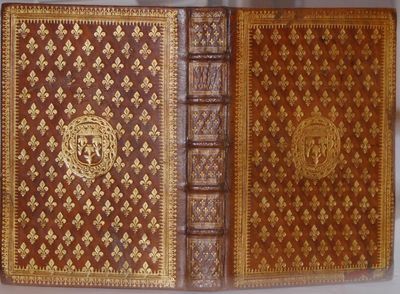 This is the most esteemed early modern translation of Xenophon's "Opera," offered here in a beautiful French prize binding executed 85 years after the volume's publication. Xenophon (ca. 430-354 B.C.) was a student of Socrates, and aside from Plato's, his works contain the only surviving examples of Socratic dialogues. Xenophon was best known to his contemporaries as an historian and general, as well as an opponent of Athenian democracy. Although born in Athens, Xenophon greatly admired Sparta and its political structure, and he eventually went to war for Sparta against the Athenians (this earned him land in Sparta, but exile from Athens). Xenophon's philosophical writings found popularity in the Renaissance, and some scholars have suggested that Machiavelli was particularly influenced by Xenophon's more "practical" (i.e., ruthless) approach to politics. According to Dibdin and Brunet, our translation by Hans Löwenklau (or Leunclavius, 1533?-93) was regarded by scholars at the time as not only superior to those that came before, but preferable even to the more famous 1625 Parisian edition by Antoine Estienne. The present second and enlarged edition (following the first in 1595) includes additional commentary and an index of Greek words and phrases compiled by Emilio and Francesco Porto. Given these additions, this particular copy is a most appropriate prize: the second flyleaf has an extensive inscription, announcing the awarding of the volume to Gabriel Boffinet, a student at the Archdiocesan Jesuit College in Rouen, for his excellence in Greek (the award made possible thanks to the generosity of the Parlement of Normandy). The presentation is signed by Charles Delaistre, then Provincial of the Society of Jesus in France, and is dated 20 August 1680. Boffinet (and subsequent readers) took excellent care of this book, but clearly used it as well, as there are occasional marks throughout in a sepia pencil, annotating and underlining key passages. Prize bindings from the 17th century appear on the market from time to time, but few could possibly be more impressive than this large, thick, and elaborately gilt volume. Darauss man alle Geheimnuss unnd Gebrechen des Weiblichen geschlechts erlernen mag. Dessgleichen von ihrer Geburt und Kindern, wie denselbigen zuhelffen unnd zu Artzneyen. Sampt mancherley Krafft der Fürnembsten Kreuter. Tugendt der Edlen Gestein. Art und Natur der Thier. Mit angehencktem bewerten Regiment für die Pestilentz. Jetzt under von neuwem durch einen der Artzney erfahrnen mit sonderm fleiss gemehret und gebessert. Sampt Einer nützlichen und bewehrten Lasstafel, für alle gebresten dess gantzen Leibs mit genugsamen underricht wie sich zur zeit dess Aderlassens und Schrepffens zuverhalten. Christian Egenolffs Erben,, Frankfurt, 1596 - Frankfurt, Christian Egenolffs Erben, 1596. Klein-8°. 180 (recte 181) S., 7 n.n. S. Register. Mit 79 Textholzschnitten. Halbleinwandband des 19. Jahrhunderts. VD 16 A 1458. - Becker, Amman 34. - Dritte Ausgabe mit den Holzschnitten von Jost Amman. Im Titel abweichend gegenüber der Ausgabe 1581 bei Feyerabend und der Ausgabe von 1608 bei Tampachs. Hier ohne den Titelholzschnitt, jedoch wie in den anderen Ausgaben mit den 22 Pflanzendarstellungen. Mit 21 (davon 2 grösseren) Tierdarstellungen, kleinen Holzschnittvignetten über die Edelsteine sowie mit Holzschnitten im "Regiment der Pestilenz". Albertus Magnus (eigentlich Albertus Bollstädt) (1193-1280) verfasste das erste Aufklärungsbuch des Mittelalters. Sämtliche deutschsprachigen Ausgaben seiner Bücher sind Bearbeitungen aus den Handschriften. Während man von Albertus Magnus Texten im 15. Jahrhundert über 50 verschiedene Ausgaben nachweisen kann, verändert sich im 16. Jahrhundert der Charakter der Texte zum Volksbuch. Das in 6 Bücher, und einem Tractat zum Aderlassen, aufgeteilte Werk behandelt im 1. Buch die Schwangerschaft und die Geburt sowie deren Komplikationen. Mit einer Reihe von Holzschnitten, die die verschiedenen Lagen des Foetus zeigen. Das 2. Buch über die Heilkräuter, das 3. Buch über die Edelsteine und ihren Einfluss, das 4. Buch von den Tieren, das 5. Buch mit einer Auswahl von Rezepten. Das 6. Buch beschreibt das Verhalten gegenüber der Pest mit einer Anleitung zu Speisen, zur Hygiene und Prävention. Im Anhang findet sich "eine nützliche Lasstafel", eine Anleitung über den Aderlass. - Titelblatt leicht angestaubt und fingerfleckig. Sonst sehr sauberes Exemplar. Ein Pflanzenholzschnitt bis in die Darstellung am unteren Rand beschnitten. Wenige Unterstreichungen von alter Hand. Halbleinwandband des 19. Jahrhunderts. Meditations Chrestiennes sur plusieurs Pseaumes. WITH: Meditation svr le Psalme cent-un. Au Roy. WITH: Meditation sur le Psalme LI. Hamburg, Heinrich Binder für Hans Scherenberg 1596.. Mit 1 Holzschnitt. 337 (recte 373) S., 13 Bll. Späterer HLdr. VD 16 C 5313; Ferguson I, 179; Ferchl 105. - Frühe deutsche Ausgabe, erstmals 1561 auf italienisch erschienen. Mit kosmetischen Rezepten, alchemistischen, chemischen sowie medizinischen Ratschlägen für den Hausgebrauch. - Gebräunt, etwas stockfleckig; Titel und letztes Blatt mit hinterlegtem Ausriss und Textverlust, dieser beim Titel handschriftl. ergänzt; Vorsatz mit Exlibris und altem Besitzvermerk. London, 1596. Small quarto. Full polished calf, leather labels, by Riviere; spine richly gilt in compartments, gilt inner dentelles, a.e.g. Upper margin of titlepage skillfully extended, with three letters and parts of ten other letters in almost imperceptible pen facsimile. A few other minor repairs to blank margins. Else a handsome, near fine copy. With bookplates of Boies Penrose and another bookplate on the rear free endpaper. Sir Walter Raleigh, famous Elizabethan courtier and adventurer, was involved in numerous schemes for establishing English colonies in the New World and in raiding the Spanish empire in the Americas. In the 1580s he was a major figure in the English court and in naval and military ventures. But in 1592, Raleigh fell from grace for marrying one of the Queen's ladies-in-waiting without the Queen's approval, and was thrown in the Tower. When released, he had lost much of his power and influence. He sought to regain it, and make a fortune, by a voyage to northern South America to seek the legendary city of El Dorado, where he believed he would find the streets paved in gold. Raleigh's voyage, usually called his second (after his voyage to found the first Virginia colony in 1585) took place under a cloud. He was strictly enjoined from attacking the Spanish, but on arrival in the Caribbean he attacked Trinidad, seizing the Spanish governor, and raiding the coast of Venezuela. He then pressed up the Orinoco River, going more than 400 miles upstream, where he turned back after obtaining samples of what appeared to be gold. This book details his pioneering exploration, in which he accurately describes the country in the most precise description made until the mid-19th century. The book also theorizes, at length, on the chimerical city of El Dorado and its vast wealth, and on the extraordinary gold ornaments he observed among the Indians of the region. The gold samples, however, proved to be worthless. On his return from the El Dorado expedition Raleigh resumed his active place in the English court, but was accused of treason on the accession of James I and confined in the Tower until 1616. When released, he made one last attempt at finding El Dorado, in a disastrous second voyage there which ended in total failure, and ultimately in Raleigh's execution. This is the third issue as identified by EUROPEAN AMERICANA and CHURCH (all were issued in 1596 and have essentially the same text and setting). This copy contains the misprint "Gallie" for "Gallego" on page , line 22. According to the entry in Sabin, a copy was offered by a London bookseller in 1885 at £50. Ansicht der Insel St. Helena ('Vera effiies et delineatio Insulae Sancta Helena, qua Ortum Occasum . - Baptista à Doetechum sculp.'). Basel, Switzerland: Sebastianum Henricpetri. 1596. Hardcover. Very Good. 1596 edition. Short, thick 8vo. in full vellum. pp. (48), 423, (1) 230, with many woodcut illustrations of planets and planetary orbits and movement, including four folding plates. Very good with minor ex-library markings: bookplate to pastedown with 'withdrawn' stamp, perforated stamp to title page, ink stamp to first page, and marking to spine. Binding tight, with moderate soil. Contents very clean and unmarked. RARE edition, with only one listed on OCLC. Wurstein (1544-1588) is credited to have first introduced Copernicus' work to Galileo Galilee, while Galileo's adoption of heliocentrism was often attributed to Michael Maestlin. This rare edition contains both Wurstisen's critique and interpretation to Puerbach but also Peurbach's own work. Digital images available upon request. Cologne Gottfried von Kempen 1596 - "Gmunden". Orig. copper-engraving after G. Hoefnagel's drawing from 1594. Published in G. Braun's and F. Hogenberg's "Civitates Orbis Terarrum", Cologne by Gottfried von Kempen, 1596/97. Orig. old colouring. With great ornamental title-cartouche and another ornamental cartouche with Hoefnagel's address. 35,5:47,5 cm. London: Robert Robinson,, 1596. with a relation of the great and Golden Citie of Manoa (which the Spanyards call El Dorado) And of the Provinces of Emeria, Arromaia, Amapaia, and other Countries, with their rivers, adjoyning. Small quarto (182 ×135 mm). Old limp blind-stamped vellum. Custom brown morocco box. Woodcut ornament to title, occasional woodcut initials and headpieces. Pale dampstain, final leaf P4 with marginal tears and a chip, wormtrack to inner blank margins of leaves B2-D1, binding soiled and with small tears, front free endpaper relaid, rear endpaper lacking; overall a very good copy with ample margins. First edition, with 12v line 12 beginning "it, there". There were three editions of this work published in the same year, more or less page-for-page reprints but with many minor differences between them sufficient to show that they are distinct editions. Sabin considers this the third, but more recently (1991) the third volume of the revised edition of STC has named this edition as the true first. 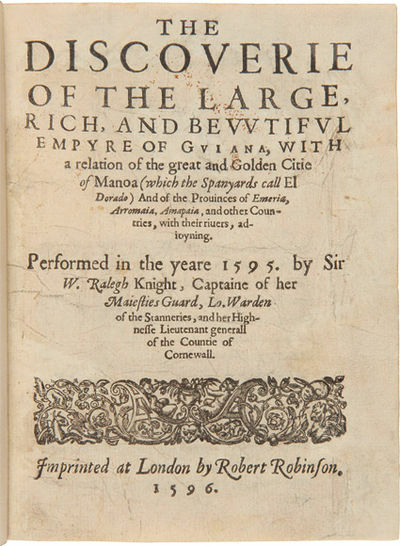 The caption title on leaf B1r and running titles on pages B2v, B3r, and B4v are in two settings; the caption title reads either "Sir Walter Raleghs discouerie of the golden empire of Guiana." or "The discouerie of Guiana." This copy has the latter setting. "In this work Raleigh gives an account of his second voyage (1595) and seems to confirm the marvellous tales concerning the Spanish city of El Dorado, which he calls by the Indian name 'Manoa'. Camus says he described the country with the exactness of a person who had been born there, but that when he speaks of the richness of Guiana he seems to have been seduced by false appearances and the accounts of the natives and Spaniards, as he did when describing the Amazons and the people whose faces seemed placed on their breasts. Another writer, with perhaps greater justness, says: 'Raleigh takes the utmost pains to state what he saw with his own eyes, what he was told by the Spaniards, or by the natives of the country, and what he inferred of the great riches of Guiana, from their accounts compared with his own observations.' This work was made use of by Hakluyt (Vol. 3); De Bry, Great Voyages, Part VIII; Hulsius, Part V; and in many other collections of voyages. Garnett includes it in this list of Three Hundred Notable Books (p. 40)" (Church). "Dedicated to Cecil and Howard of Effingham, it was an elegant and memorable piece of travel writing, at once a self-justification and a call to exploit his discoveries … The book was read widely, both at home and abroad. Latin, German, and Dutch editions all appeared within five years …Yet, all these tales of distant marvels failed to move the Cecils or the queen." (ODNB). Historia pontificale di Milano, nella quale, descrivendosi le vite de gli Arcivescovi di questa Chiesa Metropolitana, dal primo suo fondatore San Barnaba, fino al presente Illustriss. e Reverendiss. Cardinale Borromeo; si hà piena notitia dell'antichità, grandezza, e nobiltà di quella [..]. per Pandolfo Malatesta 1596 In - 8° (cm. 15,4), legatura coeva in p. pergamena floscia con titolo ms. al dorso e ai tagli; pp. 336 in ottimo stato. Interessante storia di Milano vista attraverso la vita e le opere degli arcivescovi. Prima edizione non comune. Cfr. Lozzi 2601; mentre Piantanida e Haym catalogano solo l'ediz. del 1623. Ottimo esemplare. Venice:. 1596.. Fine. An early edition of Tommaso Porcacchi's nautical map, copper engraved and hand colored, of the world as far east as India. From Porcacchi's highly successful pocket size atlas, "L'Isole Piu Famose Del Mondo ... ". 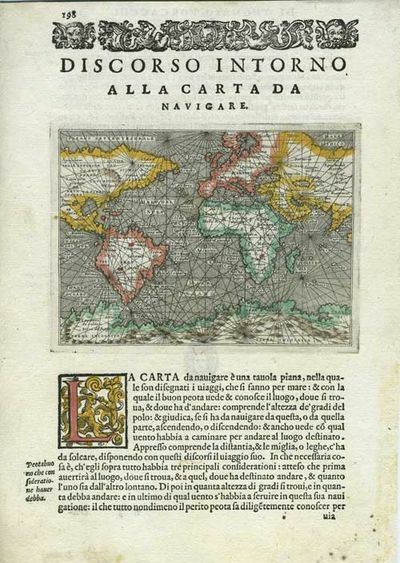 Based on Mercator's world map of 1569 and engraved by Girolamo Porro. With North America showing "L'Arcadia", "La Nova Franza", "Nova Spagna" and "La Florida"; with "Terra Incognita" at the bottom of the map. With text below map and on verso in Italian. With rhumb lines. Image size: 6 x 4 1/4". Page size: 7 1/2 x 10 3/4". Shirley: Mapping of the World, 127.